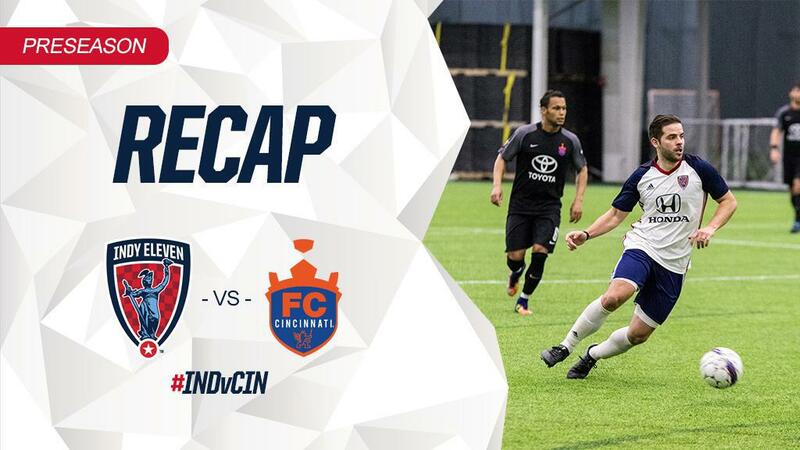 Soony Saad nets first goal of 2018 for "Boys in Blue"
INDIANAPOLIS (February 22, 2018) – Indy Eleven fall short to FC Cincinnati in first preseason match-up by a score of 1-2. The match started briskly with chances created by both sides during the opening minutes. In the fourth minute, FC Cincinnati fired a shot towards goal, but “New in Blue” goaltender Jordan Farr forced the ball from play with a diving save. Unfortunately, Farr’s save resulted in the young keeper picking up a shoulder injury and ended his match early. Just four minutes later, defender Tyler Pasher broke away up the left side of the pitch and crossed towards the center of Cincinnati’s box. The cross was met by an Indy trialist who nearly put the XI in an early lead, but was deflected by Cincinnati’s keeper. After battling for possession for much of the first period, Indy began to find its legs in its attack. In the 20th minute, Indy Eleven forward Eugene Starikov fought and retained possession as he stormed through the midfield. Once in the box, Starikov attempted to send one to the back of the next, but ultimately ended wide. Shortly after in the 26th minute, Indy Eleven defender Kevin Venegas made an end-to-end break up the right side of the pitch. With a quick through pass, Venegas’ ball found the feet of a trialist who nearly sent the ball to the back of the net once again, but Cincinnati’s keeper was quick to catch the attempt. Both sides continued to fight for possession late into the second period before FC Cincinnati found the first goal of the match. In the 49th minute, Cincinnati was awarded a penalty after an Indy Eleven trialist clipped the heel of FCC’s Forrest Lasso within the home side’s box. FCC newcomer Emmanuel Ledesma slotted the penalty home, giving the visitors the lead. The visitor’s lead was short lived when the “Boys in Blue” earned a penalty of their own in the 64th minute. Former Indy Eleven midfielder and one of FCC’s newest signings Blake Smith brought down Indy Eleven's newest signing Soony Saad in their penalty area, leading the match official to point to the spot. Saad stepped up to answer the call and sent the ball behind FCC’s Spencer Richey to level the score, 1-1. FC Cincinnati found the lead once more moments later. In the 65th minute, FCC’s Daniel Haber headed in the leading goal after meeting a cross from teammate Matthew Bahner. The “Boys in Blue” will take to the pitch again next Wednesday, February 28th, as they welcome USL side Swope Park Rangers to the next preseason home match. Want to see more of the “Boys in Blue” this season? 2018 Season Ticket packages are available now! Click here for more on how you can save up to 48% this season.